Now, I have to perfectly honest with you. I can’t draw. I can’t even draw a stick figure well. And Benji’s a psychic when he is able to figure out what the heck I have doodled for him when we do our ‘ca-yon’ sessions together. So, in my quest to create things that people MIGHT find pleasing, I depend a lot on prints & templates, etc… This year, I finally caved in and stepped into a scrapbooking shop (cringe) to pick up some stamps. I’m simply intrigued by these clear stamps that Amy – the angry chicken – was talking about. And lo & behold, stamps from HEATHER BAILEY in the shop! 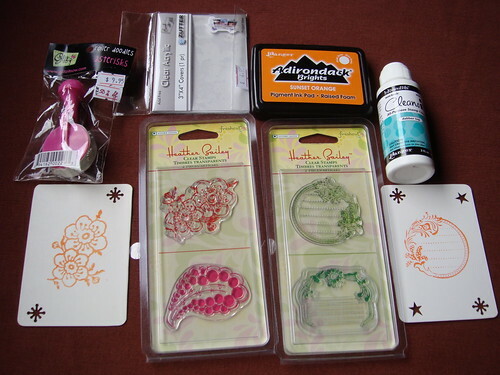 I felt like I struck jackpot – I could not even find HB’s freshcut fabrics locally, and yet I can buy her stamps?! WONDERFUL! 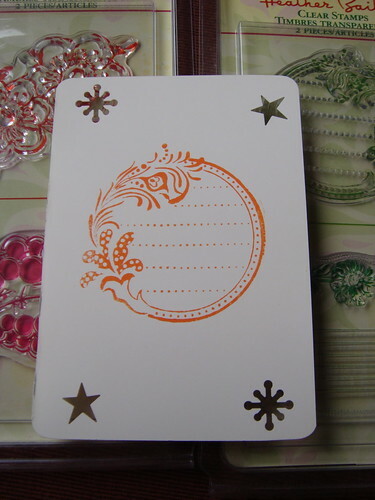 I can use these acrylic album sheets and they work just as well too. And best part of it: there are 2 pieces in there! And this is less than half the price of the blocks. BEST!